McCloud River Railroad; History: 1895-1900. The #9 with a log train taken in the early days of the road. One of the companies that found lasting success in the Sisson area was the Siskiyou Lumber and Mercantile Company, created by William M. Van Arsdale and George Scott. The company had several operations centered in the Strawberry Valley, including a large sawmill and box factory complex at Upton (just north of Sisson), a large retail store in Sisson, and four other sawmills in the area. Scott and Van Arsdale had plans for big expansions, but their big mill at Upton did not have the needed room or water. The pair approached Sisson looking for land on which to build, but they were unable to come to agreement. The pair then purchased the bankrupt operations of Friday George. The remnants of Mr. Georges operation were named Vandale after the new manager. By the summer of 1896 the pair commenced efforts to expand the sawmill at Vandale and started work on the town needed to feed and house the workforce for the contemplated operations. The new operations were to be served by a railroad, and by early summer a crew was at work building a grade following the basic route of Friday Georges traction road. The traction engine was retrofitted for grading work, and by the end of summer the grade was completed from Upton over the top of the summit and partway down the east side of the mountain towards Vandale. Track laying started in the late part of the summer, and four miles of track were down before winter closed operations down. The organizers used the winter break to tidy up some paperwork. On 21 January 1897 the articles of incorporation for the McCloud River Railroad Company were drawn up, bringing the railroad into formal existence the following day. 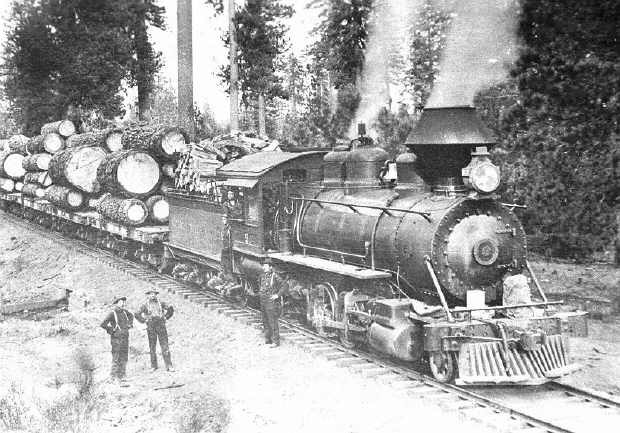 The McCloud River Lumber Company was brought into existence about the same time. The lumber company eventually came to control the railroad company, and for many of the early years the same officers served both the lumber and railroad companies. The officers in the first years were as follows; William E. Brown was president and chairman of the board, William W. Van Arsdale was the vice president and general manager, and George W. Scott was Secretary-Treasurer. All three men served in the same office in both companies. Work on the railroad resumed as soon as snow melted enough to allow for it. The grade was finished to Vandale, and track layers followed closely. The railroad was finished into Vandale on 21 July 1897, and the road was opened for business on 1 August. The new road connected with the Southern Pacific at Upton. The line ascended the west side of the ridge on a stiff 4% grade. A switchback was built at Big Canyon to assist with the elevation gain. The line continued on to the top of the grade at Pierce, then descended into the Squaw Valley, passing through a second switchback at Signal Butte. The official maximum grade was 4%, although some rumors of grades steeper than that were heard. The line was unusual in that it was built with earthen fills instead of trestles, which were used on most logging roads of the era. The company did not wait until the line to Vandale was completed to commence hauling freight, as the west side of the ridge was thickly timbered. Many loads of logs were hauled down to the Upton mill as construction progressed. 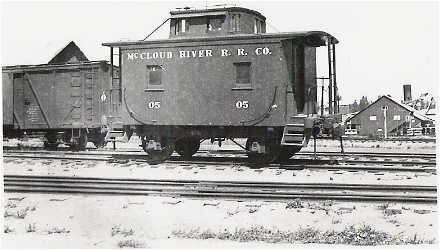 Photo depicts four-wheel caboose #05 in the McCloud yards. Unknown photographer, Brett Gibson collection. A station point on the Southern Pacific a few miles south of Sisson was named McCloud. Shortly after the completion of the McCloud River Railroad into Vandale the SP re-named the McCloud station Azalea, freeing up the McCloud name. The owners of the new venture promptly re-named Vandale to McCloud. No additional expansions of the road were made in the first year, as the owners chose instead to focus on further expansion of the mill and construction of the town. The lumber company built and owned everything in the town. Indoor plumbing and electricity were routed to every house in town. Houses were rented out to employees and their families at modest prices, and boarding houses were provided for single men. Although not directly employed by the lumber company, railroad employees enjoyed the same privileges as all other workers in the town. 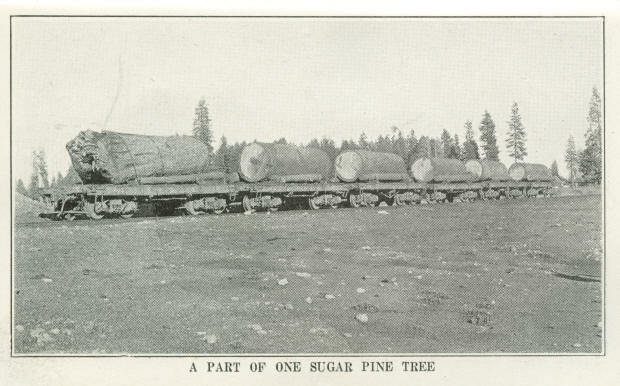 Part of a single Sugar pine tree loaded onto several of the 28-foot flatcars that the railroad used in the early years. Photo from a 1932 yearbook published by the lumber company.